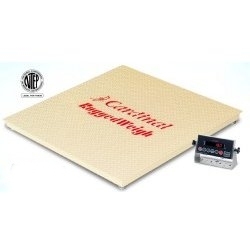 Ruggedweigh 4'x4' industrial floor scale has unique channel structure design that protects components, stainless steel load cells and junction box, low-profile platform, checkered steel deck, flexible footing for uneven floors. Factory calibrated with 180 weight indicator. NTEP legal-for-trade. 5000 lb capacity. FREE SHIPPING TO BUSINESS ADDRESS WITH LOADING DOCK / FORKLIFT FOR CUSTOMERS IN CONTINENTAL U.S.
We hear it all the time from customers... do you have any floor scales supplied by an American Manufacturer? Well, we listened and worked out a deal with the factory in Webb City, Missouri to provide you with high quality pallet scales that are in stock and ready to ship. The one catch is we were only able to secure the discounted price for a limited time. So if you believe in buying quality products this is the floor scale you need to purchase. For a limited time we are proud to be able to offer you a Made in the USA 4x4 floor scale with 5000 pound capacity. This is truly a special scale system that you don't want to pass up. And not only is the floor scale Made in America but so are the load cells and the digital weight indicator! We have partnered with Cardinal Scale Manufacturing to offer a limited time discount price on this system. The every day price on a system like this is well over $1600 when you factor in the costs of the equipment and the freight charges. We have worked out a deal with Cardinal to offer this system at a much lower cost and best of all the price includes basic LTL shipping to the 48 states! This is a fantastic deal for a made in America floor scale but you have to act now because this deal is not going to last forever. You need to press the add to cart button now or call our sales line at 919-776-7737. Cardinal Scale Manufacturing proudly offers the American-made 48" x 48" Rugged Weigh floor scale system which has a unique channel structure which provides strength and sturdy, enclosed protection for the stainless steel load cells, junction box, and wiring. This low-profile design available from Central Carolina Scale has flexible four-way approach, checkered steel deck, and special flexible footing that compensates for uneven floors. These 4x4 scales are economically priced, extremely durable, high-performance pieces of equipment. NTEP legal-for-trade certified. Factory calibrated 5,000 x 1 lb.